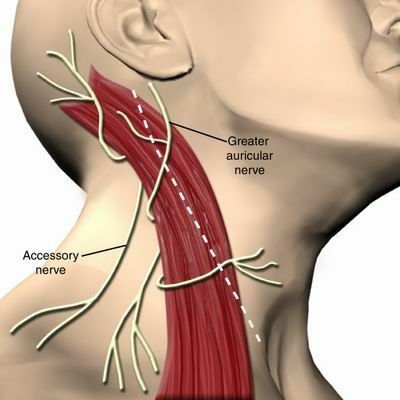 The accessory nerve controls particular muscles in the neck. It is one of the eleventh pair of the twelve pairs of cranial nerves. There are twelve cranial nerves found in the sensory-somatic system. The sensory-somatic system forms one of the two subdivisions of the peripheral nervous system. The peripheral nervous system, together with the central nervous system, comprises the nervous system. Now that we have laid the groundwork, let us look into the accessory nerve with a little more detail. Where can you find the accessory nerve? There are two accessory nerves located on each side of the body. Anatomists usually refer to these nerves as singular nerves (i.e. Accessory nerve). They control specific muscles of the neck. Due to their location, medical procedures involving the neck and head can cause damage to the accessory nerve. Unlike the other cranial nerves, the spinal accessory nerve begins outside the skull rather than inside. How can you describe the accessory nerve? The accessory nerve has a cranial part and a spinal part. The cranial part serves the same function as the vagal nerve fibers; thus, we often consider it as a component of the vagus nerve instead of the accessory nerve. The spinal accessory nerve from the central nervous system provides motor innervation for two muscles of the neck. These two muscles are the trapezius muscle (responsible for the elevation of the shoulder and abduction of the scapula) and the sternocleidomastoid muscle (tilts and rotates the head). What happens when the nerve is damaged or injured? In order to test for the function of the spinal accessory nerve, medical experts perform several tests. Among these tests are a range of motion tests, neck strength tests and shoulders strength tests. Damage to the spinal accessory nerve causes limited range of motion or poor muscle strength. This may result from a variety of injuries.